We continue our response and refutation of the false claims of Howard Denham in regard to Christ and Israel. 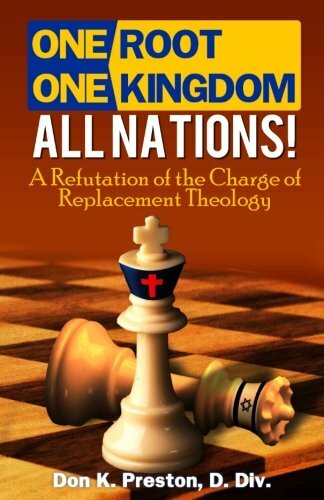 This is the third installment examining and refuting the false claims of acerbic church of Christ preacher Howard Denham, who recently made several false representations of what I believe concerning Christ and the restoration of Israel. Be sure to read the previous two installments- #1 #2. So, I do teach that God was faithful to His promise to remarry Old Covenant Israel, Israel after the flesh. But, it was not a nationalistic restoration and was never promised to be such. It was not the restoration of the Old Covenant kingdom as Denham falsely claims I have to believe. The remarriage was between YHVH and the righteous remnant of Old Covenant Israel after the flesh as the Old Covenant promises themselves foretold. As to the timing of that remarriage, I will address that later, so stay tuned for that as we continue our Responding to the Critics. Some might quibble that Preston refers to ‘spiritual Israel’ as pertains to the New Testament texts, but that entails a case of equivocation on the meaning of the term, as clearly in the texts he cited in the Old Testament the physical nation was the one divorced. Responding to the Critics: As noted in the quote, I repeat that here: ‘It is a horrible and serious exegetical error to read Israel out, and the church into these passages!’ But, this is precisely what Howard Denham does! He reads Israel of the flesh out of those OT promises and replaces her with the church! Now, should Denham come back and say that “Well, yes, on Pentecost, we see Christ preached to the Jews and that was in fulfillment of OT promises, then he has surrendered his claim that God was through with Israel at the cross! He has surrendered his idea that God was through with the Old Law at the cross. If Pentecost was in any sense the fulfilling of God’s Old Covenant promises made to Old Covenant Israel, then that means that those promises– those covenant promises – were still valid on Pentecost! Not only that, but, should Denham admit– and how could he deny it – that what was happening on Pentecost was dealing with Jews – Israel after the flesh– then he has surrendered his condemnation of my emphasis on the truth that God’s promises were “to the Jew first, and then the Greek.” Pentecost was God fulfilling His Old Covenant promises made to Old Covenant Israel after the flesh! You must catch the power of this! (Just like in Acts 3:19f, noted above. There Peter reminded his audience that the sending of Jesus was in fulfillment of God’s promises to the fathers– the Old Covenant fathers. Let me reiterate a point from earlier. Were those converted on Pentecost “spiritual Jews”? No dispute there. But, as just seen, they were also Israel after the flesh receiving the fulfillment of the Old Covenant promises made to Israel after the flesh! Indisputably! There is no equivocation from Preston on this. I am in full agreement with Luke who witnessed that the audience that Pentecost was comprised of “Jews out of every nation under heaven.” And I am in full agreement with the fact that Peter cited promise after promise from the OT promises made to Israel and affirmed that those promises were being fulfilled that day. That was well after the cross when God was supposedly through with the very people gathered there that day. He was supposedly through with the promises made in the OT. Yet, Peter says those OT promises were being fulfilled! How do abrogated, annulled promises get fulfilled, Mr. Denham? Responding to the Critics: And who has disputed this? Who has denied this? I preach, teach and write that the body of Christ is the true Israel. I teach that the true circumcision was that of the heart. I do not, and have not, ever, taught that the mere fact of being an Israelite after the flesh guaranteed salvation! What I have taught, and do teach is what I have explicated above. The righteous remnant was the remnant after the flesh. God did not make His promises to those of Israel that would reject His invitation to accept Messiah. But, He did promise that those “Israelites after the flesh” who were of faith were the ones to whom the promises would ultimately be fulfilled. That is why Paul emphasized that God had not cast off Israel after the flesh, and that as a member of the tribe of Benjamin he was living proof of that. Paul’s doctrine was that the righteous remnant of Israel after the flesh, “spiritual Israel” if you please, joined with Gentile believers and comprised the “One New Man.” This does not negate, in any way whatsoever, that the righteous remnant of Israel after the flesh were receiving the Old Covenant promises made to Old Covenant Israel. Denham’s charge that my position demands that Christ would marry “spiritual Israel but not the church” is simply specious and illogical. It is based on both ignorance of God’s promises and rejection of God’s word. The righteous remnant of Israel comprised a foundational part of the church, Mr. Denham! There is no confusion here, except in the mind of Denham. There is no contradiction here, except the contradiction of Deham’s teaching by the divine text. Stay tuned as we continue this series on Responding to the Critics. 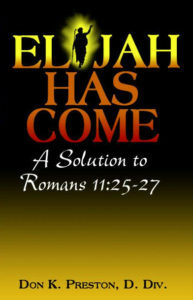 Be sure to get a copy of my book, Elijah Has Come: A Solution to Romans 11:25-27 in which I set forth what the Bible teaches about the restoration of Israel in the first century.